Patrick Apel-Muller is a journalist of L’Humanité, he’s what in France is called the editorial director. A senior editor with some extra powers. So nearly a director, although formally this role is played by the Communist MEP Patrick Le Hyaric, but the latter must divide his responsibilities between the newspaper and the European Parliament in Strasbourg. Ours is a newspaper with a long history. It was founded in 1904 by Jean Jaurès, who called it a newspaper of “associates” because Juares’ project was supported by a broad constellation of intellectuals, some of which were indeed associate professors, like the socialist leader. This meant that the newspaper became the tribune of workers’ struggles, a reference point for the socialist galaxy, then very different to today, and finally it was pacifist, ten years before the outbreak of the First World War when militarism was taking hold at an alarming rate both in France and in Germany. Over the past decade the Communists in France have changed a lot, up to the recent unitary experience of the Front de Gauche. Has the same thing also happened to l’Humanité? Is it correct to say that you are the newspaper of the Front de Gauche? Is this favourable environment reflected in a consensus among the public, with positive returns in the sales of the newspaper? 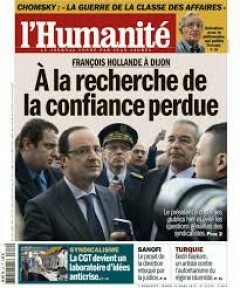 We sell about 50,000 copies each day, which rise to 75,000 on Sunday with l’Humanité Dimanche, and during 2012 we increased newsstand sales while the vast majority of other newspapers lost readers. Among the newspapers in France we have had the most positive trend in terms of sales. But we must not rest on our laurels, because circulation across the whole of the French press is falling, by about 25%, and media analysts expect this to continue in the coming years. Evidently we enjoy advantages because of the originality of our editorial policy, the fact that we are opposed to neoliberal thinking that prevails in the French media. We also have potential readers among all those who do not accept capitalism in France and are wondering how you can continue to survive on our planet. And in fact we constitute an added value to the world of information, using the Internet and by providing new products such as “l’Humanité Europe”, which also publishes articles from all over Europe that ask questions about the future of the Old Continent. In Italy, due to cuts in public financing of publishing, many newspapers, including communist daily Liberazione, have been forced to close or to publish exclusively on online. And now with the back lash against politics that is raging, there is a risk that resources for the press are virtually eliminated with the consequences you can imagine. In France, how does it work? The funding here in France comes from various sources. There is a low tax regime for all newspapers. There is also aid to those who modernise but support is distributed, paradoxically, according to the financial situation of the newspapers themselves, favouring those who have more resources. For example if you invest 100,000 euros the state gives you as much again, but if you do not have that kind of money you’re penalized. In short, this is a measure that favours the strongest. Have there been cuts at l’Humanite too? In 2010-2012 we had a cut amounting to a million Euros for us, which was heavy for our coffers. In Italy, especially with the Monti government, the idea has taken hold that it should be the market that decides the fate of a title. In France, the scenario is different, but we also have people who claim that only the wealthy media outlets should survive. The battle thus revolves around the presence of a plurality of titles. With us there have been several incidents that have caused a crisis of confidence in the press. For example, in 2005, all newspapers except l’Humanité and some weeklies, took a position in favour of the European Constitution. We all remember the result of the referendum of 29 May 2005, when 55% of the French voted No. After that the gulf that separated the media from the public widened and led to a crisis of confidence in the press. Even on the issue of pensions, 65% of the French were hostile to proposed reforms while the vast majority of the media supported them, thereby fueling this mistrust. Even a prestigious and progressive title like “le Monde” has become part of this [neo-liberal] chorus? You talked of a favourable moment in time for the life of l’Humanité. What was, instead, the most difficult moment for your newspaper? Posted in: Activism, Europe, International, Media. Was Blair the ideological child of Thatcher?